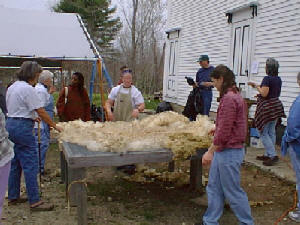 Once the fleece is gathered up from the shearing platform it is tossed open over a screened table for skirting, the operation that gets a fleece ready to take home before it is washed or sent to the processor. 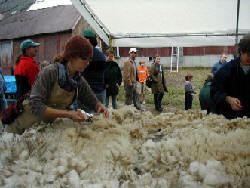 The skirters spread out the fleece and work quickly while the next sheep is being shorn. 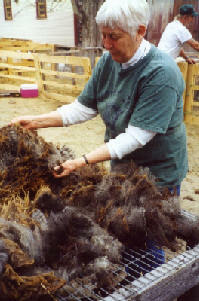 First they pull off any remaining short, soiled belly wool, neck and leg wool, and manure tags, locks that are clumped together. 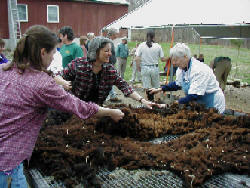 They remove wool that may be contaminated with seeds or vegetation. 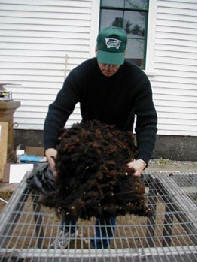 This is waste wool as it is hard to process and no fun to spin. 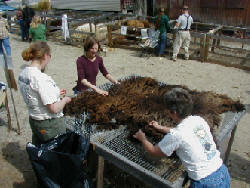 Some fleeces are pretty clean and any vegetation can be picked away easily. 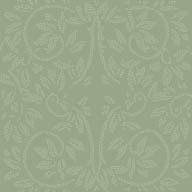 Others may have a lot of non-wool matter. the process goes a lot faster if there is a "skirting crew". 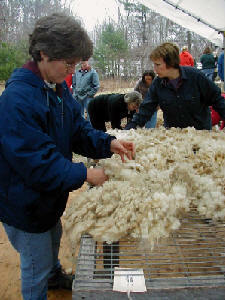 This is a good way to learn a lot about fleece! Skirting the fleece as it comes off the sheep means that the owner of the fleece can take it home knowing that soiled wool and vegetation are not being bagged up with the good fleece. 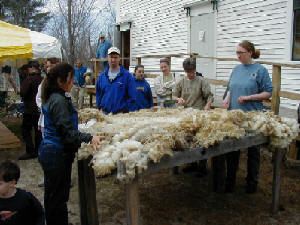 Once the fleece has been skirted it is rolled, bagged and weighed. There is a lot of satisfaction derived from skirting a fleece well getting it ready for a discerning customer. 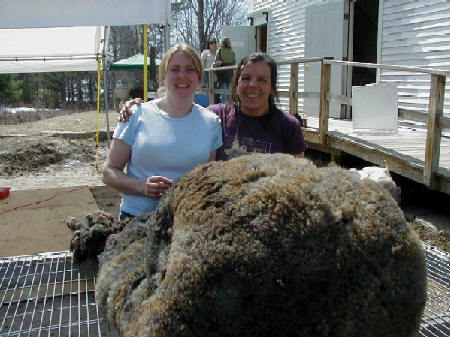 With 40 to fifty sheep being sheared at the Sheepfest these folks put in a long day making sure you go home with a well-skirted fleece whether it is large or small. 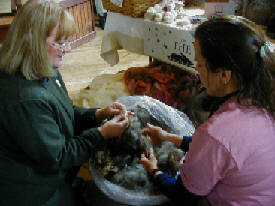 The Sheepfest is a good place to come if you are looking for a really fresh fleece!